As has been widely reported in the media today, six months after I (along with the rest of the country) wrote him off, Newt Gingrich is having some success positioning himself as the latest “Not Mitt Romney” candidate. 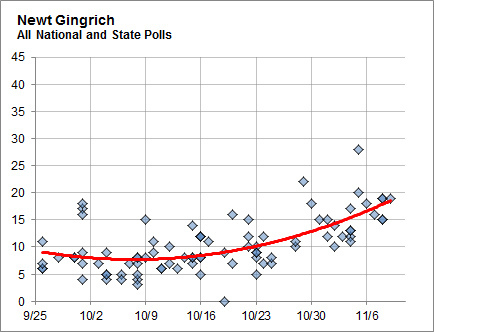 As Nate Silver showed last week, over the last two months, Gingrich’s trend lines are the best in the Republican field, and while he still trails both Cain and Romney, he is clearly on the upswing while Cain and Romney seem to be fading a little. Meanwhile a raft of new polling released in the past few days confirms that surge, with one poll even showing Newt leading the Republican field. I have to admit that I didn’t watch the foreign policy debate on Saturday. I watched Rick Perry’s self-immolation on Wednesday and I just couldn’t bear to watch any more on Saturday. Like most, I think Perry’s meltdown marks the death knell of his already faltering campaign. Meanwhile, Herman Cain continued to do what he has done in every debate, which is to repeat “NINE-NINE-NINE” at every possible turn. I’m no expert at predicting how Republicans judge candidates, but I think it is becoming more and more evident that, in Cain’s case, the Emperor Wears No Clothes. And while constantly repeating “NINE-NINE-NINE” might be a great way of getting attention, at some point voters are going to expect you to take it to the next level. It’s not clear to me that Cain has a next level. As Mike Murphy tweeted after the foreign policy debate, and Mark Halperin seconded, Cain’s answers always seem to be a mile wide and an inch deep. What’s interesting about a switch to Newt is that, as Mark Halperin pointed out last week, Gingrich may be the person most likely to become the alternative to Romney, but he’s also the least likely to beat Romney. Gingrich brings a treasure trove of political liabilities to the presidential race. And given that only about 5% of GOP voters in a recent poll rated Gingrich as the most likely to beat Barack Obama, the swing to Gingrich seems to indicate that Republicans might be done searching for a viable alternative to Romney and are now just looking for a credible protest vote to cast. The bottom line is that, despite Mitt’s yearlong stagnation in the polls and the fact that he’s the last choice of so many conservative Republicans, the paucity of credible alternatives puts him in a pretty good position. The self inflicted wounds of Perry and Cain over the past few weeks have just amplified this advantage. All in all, a pretty good couple of weeks for the Romney camp. This guy has to be the consensus choice for whiner of the month. It makes me so mad that I want to go out to a rally and paint a Hitler moustache on my John Boehner sign. He was an icon for our time and probably the most influential entrepreneur in modern times. It’s not an exaggeration to say that he revolutionized three different industries: the computer industry, the music industry and the wireless phone industry. As Thomas Friedman once said, “I would have been happy with my Sony Walkman had Apple not invented the iPod. Now I can’t live without my iPod. I didn’t know I wanted it, but Apple did.” You can say the same for the PC, the iPhone and the iPad. 56 is too young, but Jobs burned bright. He will be missed. Public employee unions have been a convenient scapegoat this year, but it’s hard to read this piece and not argue that the negotiated contracts are out of control in New York City and that this has had a significant effect on outcomes. Here’s Greg Sargent on John McCain’s push back to Condi, Rumsfeld, Cheney, et al’s argument that evidence gained by torture led to the death of Osama bin Laden. Nice development. Wasn’t sure if we were going to see the old McCain again.